SCE Graph effect creates trigonometric graphs. This MADRIX Effect is extremely versatile. ▪ Height - Defines the height of elements depending on the direction [in % of the Matrix Size]. The default value is 10. Valid values range from 0.01 to 100. ▪ Width 1 - Defines the width of elements depending on the direction [in % of the Matrix Size]. The default value is 10. Valid values range from 0.01 to 100. ▪ Pitch 1 - Defines the distance between elements depending on the direction [in % of the Matrix Size]. The default value is 10. Valid values range from 0.01 to 100. ▪ Width 2 - Is available when selecting Register Z1, Z2, or Z3. Defines the width of elements [in % of the Matrix Size]. The default value is 10. Valid values range from 0.01 to 100. ▪ Pitch 2 - Is available when selecting Register Z1, Z2, or Z3. Defines the distance between elements [in % of the Matrix Size]. The default value is 10. Valid values range from 0.01 to 100. ▪ Frequency - Defines the rate. A value of 1 means that the complete wave is shown. The default value is 1. Valid values range from 0 to 100. ▪ Amplitude - Defines the maximum oscillation of the elements in relation to the baseline. The default value is 100. Valid values range from -1000 to 1000. ▪ Phase - Defines an offset that allows you to shift the waves compared to each other when combining at least 2 graphs in order to avoid overlapping [in % of the wave length]. The default value is 0. Valid values range from 0 to 100. ▪ Peak - Defines the peak of the wave [in % of the wavelength]. It is only available for Draw Mode Triangle and Square. The default value is 50. Valid values range from 0 to 100. Shape - Allows you to choose a specific shape for objects. A certain Size is required before a shape becomes visible. This heavily influences the visual outcome of the effect. The default Shape is Rectangle Filled. Draw Mode - Allows you to change the graph form, which influences how the effect is drawn [Sine, Absolute Sine, Cosine, Triangle, Square]. 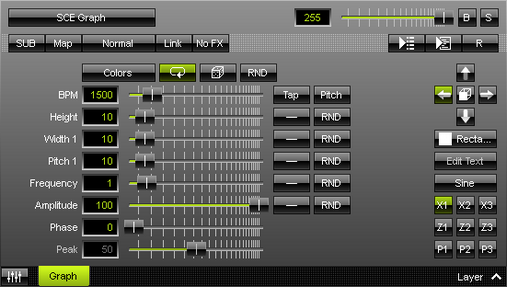 The default Draw Mode is Sine. ▪ Choose Draw Mode Text in order to use text as elements of the graph. ▪ Clock Edit Text to change the text settings. ▪ A new window opens. ▪ Text - Allows you to enter any text. Simply write something via your keyboard. 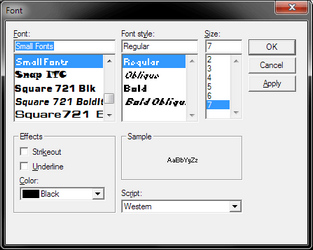 ▪ Aa - Opens a new window and allows you to choose a specific font, font size, and other font settings. ▪ Rotation - Allows you to rotate the text [0°, 90°, 180°, 270°]. The default value is 0. ▪ Splitting - Allows you to split your text. None - Is the default value and does not apply any splitting. Words - Splits your text using each word, adds line breaks, and displays each word below the other. Characters - Splits your text using each character [letter], adds line breaks, and displays each character below the other. ▪ Repeat Text - Uses your text continuously for each element of the graph. ▪ Reverse Words - Displays the words of your text in reverse order. ▪ Reverse Characters - Displays your complete text in reverse order, character by character.